This metal bucket comes in handy for everyday use around the home, shop, or farm. Use in crafts, decorations, gift baskets, floral arrangements, planters, loose item storage, or as a ice bucket for beverages. 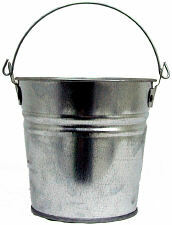 Pre-Galvanized metal bucket with body swedges to add strength to the bucket. Tough, strong bail allows for easy handling even with the bucket filled to capacity. Please note: 2Qt. Metal Buckets may arrive with small scratches and blemishes due to the shiny surface and movement in shipping. We pack these buckets well but some shifting and settling during shipping may occur.